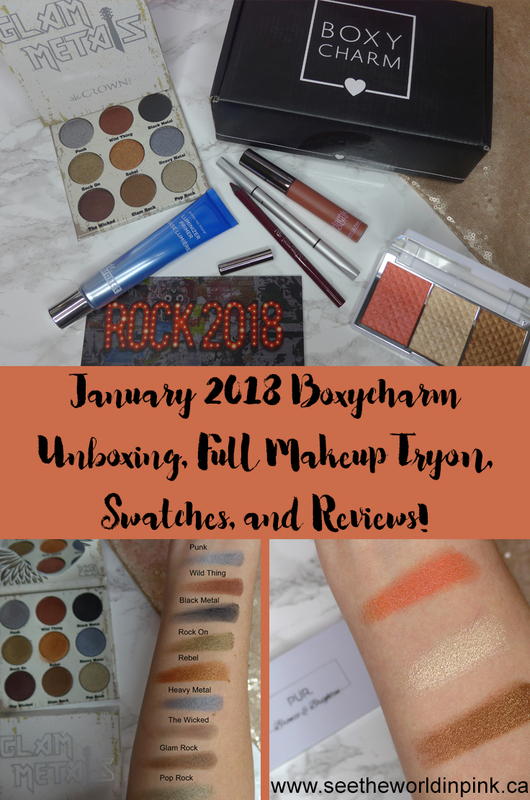 The theme of this month's box is called "Rock 2018" which seems appropriate for the first box of the New Year! Boxycharm always includes a detailed product card explaining the items that were included in each month's subscription. Crown Pro - Glam Metals Palette ~ $29.99 US. Rock Your Look with the Crown Pro Glam Metals eyeshadow palette! 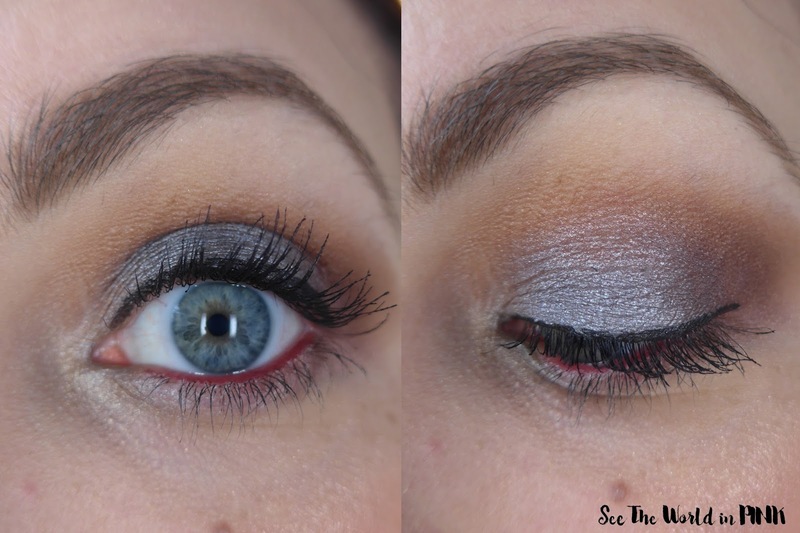 These highly pigmented, ultra-blendable shadows make smokey eye looks a breeze! To take your look up a notch, wet your eyeshadow brush before application. This will intensify the foiling effect of the shadows, resulting in a sultry, smokey glam that will make you want to Rock the night away! I was maybe a little skeptical about receiving an eyeshadow palette from Crown as I tend to think about them as a makeup brush company (although, the same could be said about Morphe and I have a palette from them too...) I will say that I think this palette is a little overpriced in comparison to the other Crown palettes on their websites that have 20 shadows for $25. But, I do like that Boxycharm is sending some unique palettes and I'm actually in to the mix of browns with those pops of blue & silver! This palette swatched really beautiful - the foiled and shimmer shadows are gorgeous; but, I did notice that the mattes seemed a little powdery. Now, these all applied to the eyes very well! The matte shadow The Wicked looked really great on the eyes! All the foiled shadows look amazing when applied - and were all smooth and easy to apply. When I applied Heavy Metal with Mac+ to the lids it was so soft on the lids! I'm pleasantly surprised by this palette! But, this isn't a stand alone palette - I did have to use a light base shadow underneath and a light transition shade in the crease prior to creating a whole look with this palette. Pur Cosmetics Bronze & Brighten Cheek Palette ~ $34.00 US. An on-the-go highlight, bronzer and blush palette with three skin perfecting powders to create an effortless and sun-kissed glow on every skin tone. Featuring PUR’s fan favorites Afterglow and Mineral Glow along with a new blush shade, Blushing Glow, throw this in your bag and you’re ready to go! These swatches are crazy pigmented! Whoa! The blush is called "Blushing Glow", the highlighter is called "Afterglow", and the bronzer is called "Mineral Glow". Unfortunately, these super pigmented face products just did not work for me. These were very powdery; but, applied to the face incredibly patchy on the skin and did not blend out well. Even the tiniest amount went on the skin almost too bright and I just couldn't make them work for me. Makeup Geek Full Spectrum Eye Liner in Plumeria ~ $9.00 US. So, I will start by saying that this was not a regular item in this month's box - I received a duplicate item in my December box, so this was sent as a replacement item. It's a bit of a price difference; but, I am excited to try more products from Makeup Geek. But, weirdly these aren't available on the Makeup Geek website? I love the shade Plumeria too! It Cosmetics Brow Power Universal Eyebrow Pencil in Universal Taupe ~ $34.00 CAD. Developed with plastic surgeons, IT Cosmetics’ #1 best-selling*, award-winning eyebrow pencil is infused with brow-enhancing biotin, lecithin, saw palmetto, nettle, green tea, antioxidants, grape seed, and vitamins A, B5, C and E, plus proprietary Brow Power™ Technology to give you your most beautiful, natural-looking brows—even if you have none at all. Plus, its universal transforming shade adjusts to all hair colors based on pressure, its exclusive oval tip mimics the look of real hair and it includes a built-in grooming spooley brush for polished perfection! *#1 brow formula for IT Cosmetics brand. This is one of all time favorite brow products - this was actually in my August 2015 Favorites! Holy! I received this in a past Ipsy bag and loved it so much I immediately bought a back up with points; but, I have been using this a couple of times a week since Summer 2015 and I just finished my first pencil. So, this came just in time because I think my original back up is going to be too old to use by now! The Makeup Geek eyeliner was super smooth and well pigmented. I love the shade and this wore really nicely! I was impressed that it stayed on my waterline for hours and still looked really good - very happy with this. And, the It Cosmetics Brow Power goes on very smoothly - this is an interesting product in that it is described as Universal Taupe. The colour of the Brow Power changes by how much pressure you use when applying it to the brows - the lighter the application, the lighter the shade and vis versa. I love the application of this as I prefer a more natural, filled in brow. This is great for me. Girlactik Long Lasting Matte Lip Paint in "Posh" ~ $28.35 CAN. One of the original liquid lipstick formulas that is still true to its words - it's lightweight, long wearing, non-cracking and won’t settle. For better application, do not apply a lip balm or lip primer before application. I'm always happy to see a matte lip - I know the new trend is more glossy; but, I love not having to worry about lipstick transferring. I have long hair that flies arounds and kids that would just smudge everything if it doesn't dry down on me. I think this shade is fairly similar to a Tarte lipstick I received a few month's back but I do like it. Dr. Brandt Pores No More Luminizer Primer ~ $38.00 US. Luminizer Primer delivers a natural radiant glow while blurring pores and imperfections for a beautifully illuminated flawless complexion. I have enjoyed Dr. Brandt's products that I have tried before so I am excited to try a primer from the brand. I like the Girlactik matte lipstick - the shade was nice and the formula was really nice to wear. I do think that it was a lightweight formula and didn't feel too dry or tight on the lips. There was little transfer and it wore well throughout the day and lunch. The Dr. Brandt primer was nice as well. I thought it applied really smoothly and my foundation adhered really nice to it. I didn't find it overly luminizing for the skin, I actually thought it leaned a touch matte - but, that being said I liked this primer and it made my makeup look great all day. I have the Dr. Brandt primer as a base, the It Cosmetics Brow Power on my brows, the Makeup Geek eyeliner in Plumeria on the waterline, and the Girlactik matte lipstick in Posh on the lips. I'm also wearing the blush, bronzer, and highlighter from Pur Cosmetics Bronze and Brighten Cheek palette on the face, and the Crown Glam Metals palette - Wild Thing to deepen the crease, Glam Rock and The Wicked in my outer corner, and Heavy Metal all over the lid. Here is a close up of the shadows, eyeliner and brows! Overall, very happy with these 3 products! And, here is the close up of the Girlactik matte lipstick. I think it wore well, it does dry down but I liked the wear of this lipstick! Boxycharm came with 6 full sized items (1 to make up for December) and a value of $173.34. This subscription came with a good variety of all makeup and I love that. I love the palette, liner, primer, brow product and eyeliner - the only thing that was a miss for me was the face palette. I thought this month was really good! It looks like you got some great items! I've been wanting to try Girlactik's liquid lipsticks for awhile now, they look great! 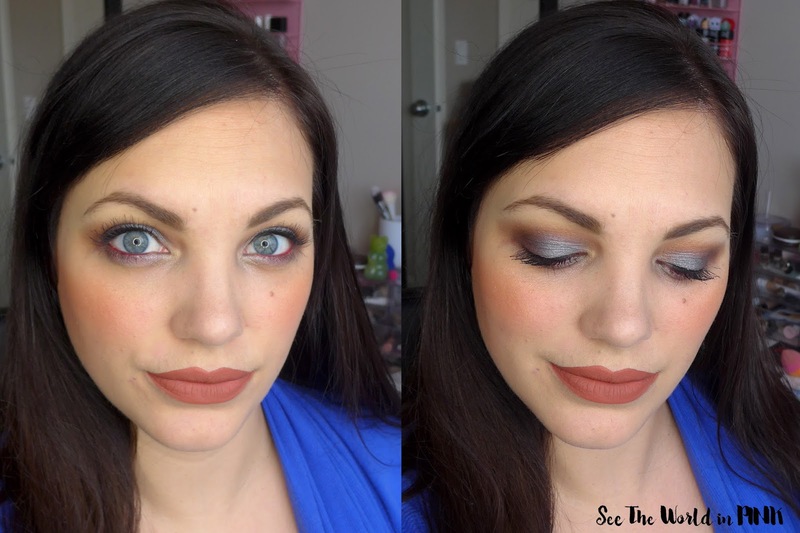 I was really impressed with the formula for sure of the lipsticks!